The film sequel that we were all waiting for is finally here! No, not 'Guardians Of The Galaxy, Vol 2'. No, not 'War for the Planet of the Apes' either. 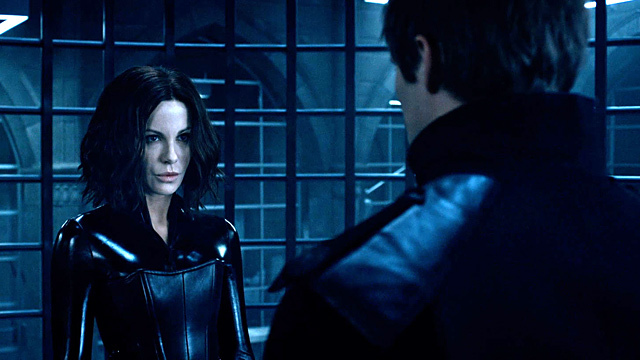 Of course, I'm talking about 'Underworld: Blood Wars'! The war between the Lycan's and the vampires is still ongoing as a new Lycan leader Marius (Tobias Menzies) looks to have made the clan more powerful than ever. The vampires look to bring back Selene (Kate Beckinsale) in order to help the vampire cause. Betrayals look to stand in the way of the vampires battle against the Lycans that could cost them their entire existence. Believe it or not, this is the fourth film in the 'Underworld' franchise that is seemingly only continuing in order for Kate Beckinsale to have work. Producer Len Wiseman must have some pull around the film studio to continue getting these films made, which may finally come to an end due to the couple's recent divorce. 'Underworld: Blood Wars' is simply everything that is wrong with a lot of modern action movies. The list of problems is endless in this truly awful blend of horror and action that just creates a gothic nightmare. The film is a crime against action filmmaking as its shaky, quick cut style is unbearable to watch. Whilst watching this film, you won't be able to keep up with the action or will just end up with a sore head from trying to do so. The style of action does not fit this style of filming as this spoils any chance of good action sequences happening in the film. If you were to see this in 3D, I can't imagine you leaving the cinema without a migraine for days. If the mind-numbing action doesn't give you a headache then the sound effects most definitely will. Every punch, kick or form of contact is accompanied by a loud, ear-bursting blaring noise that makes the action scenes completely unenjoyable. The sound effects are overused in 'Blood Wars' as someone seemingly went overboard with them. The film bases it story on the fact that a new Lycan leader, Marius, has made the clan a great threat as they have shown more unity and teamwork than ever before. This is one of the laziest examples of screenwriting as rather than actually showing these qualities it just says so and doesn't back it up at all. In fact, the film does the opposite as we see more of the Lycans fighting and getting angry at each other more than working as a unit. The film doesn't even make Marius seem like something special either as he doesn't seem more powerful or wise than any other Lycan. The film doesn't really bother in developing its villain so there's no reason for the audience to care about or be invested in him at all. Kate Beckinsale returns to the helm of the franchise and her character Selene poses a problem for the audience. In an action movie, you don't just want a hero who can do everything with ease or that you know will just end up coming back eventually. If the hero is like this, there are no stakes in the film and the tension is removed immediately. Again, it doesn't help that the villain up against our main hero was handled poorly. The vampires as a whole provide many terrible moments within the film. There's a side story where Lara Pulver's character rallies a betrayal against Selene. This causes some incredibly ridiculous scenes within the film, including some between Pulver and Bradley James' Varga. This story is so incredibly stupid and is so much of a burden to the vampires that you cannot believe they are carrying it out. Even for this film, this made no sense whatsoever and was hard to believe when watching the film. There is very little to enjoy in this film for the general audience. If you like this franchise then you may enjoy this, likewise if you just like terribly shot, lazy action movies. There is an interesting story as the mythical side could work. However, those involved in creating this series are not adequate at putting in the effort to do so. This film is simply awful and its due to the lack of trying. This is the kind of film that annoys viewers as it so lazily executed. So have you seen 'Underworld: Blood Wars'? If so, what did you think of the movie? I hope that this review was useful for if you were planning on seeing the movie. I recommend that you stay as far away from this one as possible. Once again, thank you for taking the time to read my review, it is much appreciated!